Monolith Soft has been churning out new content as part of Xenoblade Chronicles 2’s Expansion Pass since its original release back in December of last year. 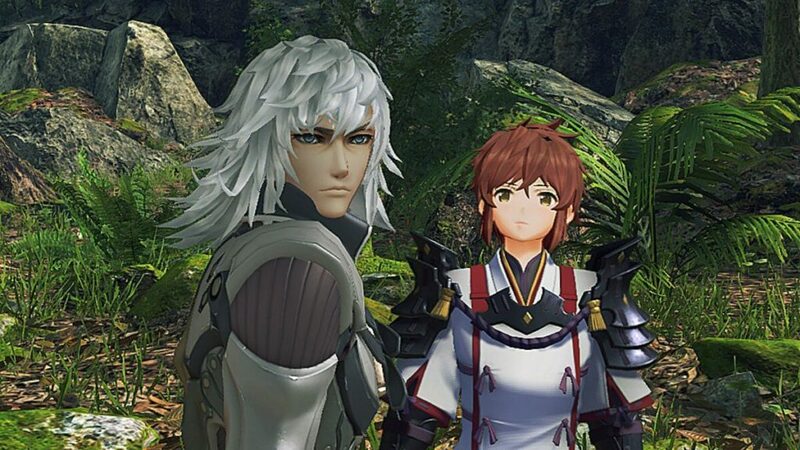 The $20 add-on has since included new sidequests, new rare blades, and a new challenge mode to the main game but it wasn’t until the story DLC, Torna ~ The Golden Country, released that its true worth could be measured. While this DLC episode shares many of the strengths and weaknesses of the base game it still manages to distinguish itself in a way that makes the return to Alrest worth the investment. Torna ~ The Golden Country is a prequel that takes place 500 years prior to the events of the main story. The adventure follows Tornan Driver, Lora, and her Blade partner, Jin, as they play their part in the crisis that was the Aegis War which threatened to destroy all of Alrest. This DLC fills in the gaps purposefully left by the original story and gives important context for the motivations of many characters. Lora is a good-natured woman with a heart of gold to help those in need but also a maturity to think things through before acting. This carries through to her connection with Jin, as they have been together for seventeen years and that shines through in their complete trust and candidness with each other. 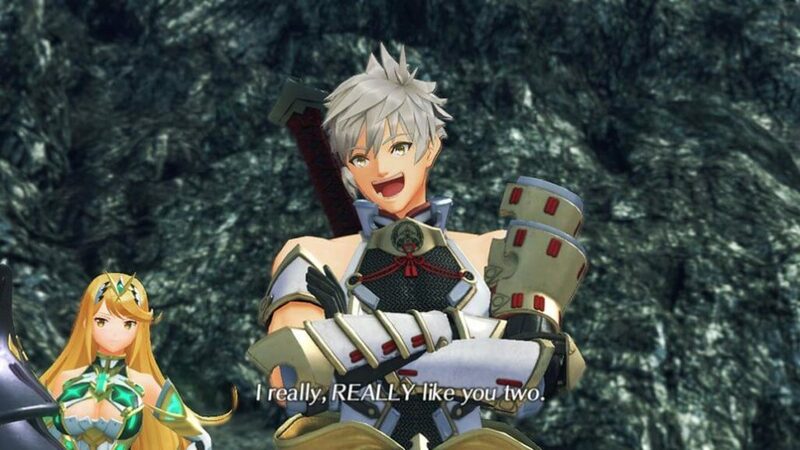 It’s certainly a different dynamic than the “boy-meets-girl” scenario of Rex and Pyra in the original game, and one that is a joy to watch grow over the course of the adventure. Other new characters, such as the charismatic Addam, are equally engaging while returning characters, such as Brighid and Mythra, are shown in a different light that exposes new and endearing facets of their personalities. Unfortunately, poor lip syncing of the English voice-overs make a return, detracting from an already grab bag of voice talent. While the original Japanese voice audio is available, this is still a regrettable drawback for those who prefer the dub. Nintendo is advertising Torna ~ The Golden Country as a standalone expansion that can be enjoyed without the context of the original. While this is technically true from a gameplay perspective it would not be recommended to do so from a story perspective. Many of the most emotional scenes in the game stem from the tender moments between Jin, Lora, and others with the knowledge of the morbid reality fate has in store for them. The gravity of these moments is lost upon those who have not played the original game to some extent. Torna ~ The Golden Country takes place before the traditional Blade and Driver fighting styles of the original Xenoblade Chronicles 2 were established and, as such, combat plays out quite differently. Drivers and Blades still form pairs and fight together in real-time using a palette of three regular artes and a special, but the similarities end there. Instead of the Blade swapping mechanic of the original, we have a Vanguard and Rear Guard system. The player directly controls the Vanguard character, moving around, auto-attacking, and using artes much like before, while the computer controls the Rear Guard and plays a support role by using various buffs, debuffs, and damage dealing skills. The current Vanguard and Rear Guard can be swapped with each other on a cooldown with a simple tap of the D-pad. This not only gives the player a brand new character to control with his or her own unique set of artes but will also recover a portion of your team’s health represented by a red section of the health bar. Since traditional healing skills aren’t as readily available in this expansion as the original, combat keeps the player on their toes by encouraging frequent swapping of Vanguard and Rear Guard in order to keep teams healthy. Performing a Vanguard swap to recover from the brink of death while simultaneously smashing a launched enemy to the ground provides a visceral satisfaction not present in the original game. 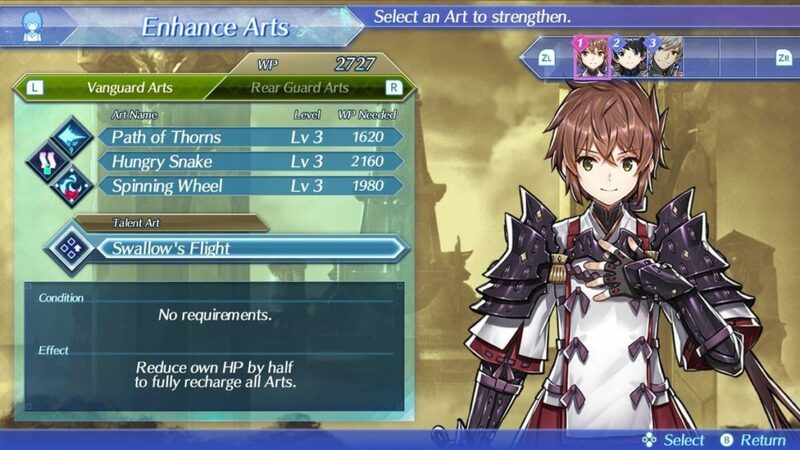 In addition to regular artes, specials, and swaps, team members now have access to character specific Talent Artes. These often bestow powerful effects, such as instantly recharging all regular artes or stopping enemy actions for a time, but come at a heavy cost or prerequisite, such as halving your current HP or drawing three times as much aggro with the next attack. This adds some welcome individuality to each party member and knowing when and when not to use these versatile skills adds a risk vs. reward factor that can turn the tide of battle when used properly and vice versa. Team compositions are fixed, which means that there is no randomness from the controversial Core Crystal system of the original game. While this does result in less flexibility in party setup, as only the element of a Driver’s weapon can be changed, this does allow for more focused combat encounters that have been designed specifically for the hand the player has been dealt. Defeat never feels like a foregone conclusion due to poor team composition but rather due to lapses in judgment that are easily identified and learned from for the next attempt. This results in a fast-paced, rapidly evolving combat style that builds upon the skeleton of the original game in unique and engaging ways that make it feel new once again. 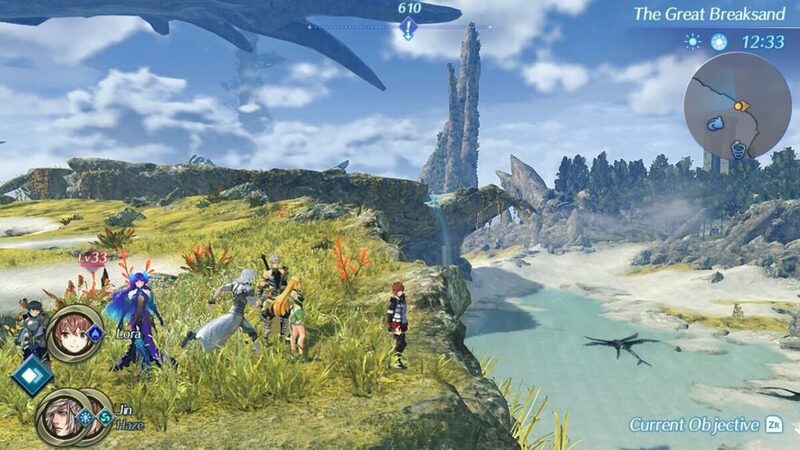 Exploration has always played an enormous role in Xenoblade games and Torna ~ The Golden Country doesn’t use its status as a DLC episode to shirk those responsibilities. The brand new Tornan titan that we had only heard mention and seen glimpses of before in flashbacks is on full display in all its glory. Boasting environments such as woodlands and desert dunes, Torna provides sceneries and landscapes not present in the original game. While these new zones aren’t quite as large as other titans we’ve seen previously, they still properly stoke an explorer’s adventurous spirit with treasure to uncover and secrets to discover in every nook and cranny. A much needed auto-save feature, not present in the original, ensures that the many hours spent exploring won’t be lost due to an unfortunate accident or battery depletion. The grasslands of Gormott also make a return, although they may look a little different compared to the ones players know from the original. While the overall topography remains unchanged, new landmarks are present while others simply don’t exist yet, passages that once led to one location now lead somewhere else, and so forth. Perhaps the biggest difference is how the sprawling city of Torigoth in the original game is simply referred to as a “small hamlet” in this prequel. These little difference not only make an old area feel fresh but also lend credence to this story taking place 500 years before the original, that this is a time period different from the one we know. The immersion isn’t perfect, however, as most NPC’s still wear the exact same clothing from the original, the Mor Ardanian flagship has the exact same layout, and all of the regular monsters you fight are exactly the same. While this is a relatively minor gripe, it’s still a shame Monolith Soft wasn’t able to take that extra step to really expand upon this tumultuous time period for Alrest. During exploration, your party will come across numerous campsites to rest at for the night. These serve a dual purpose of allocating bonus experience points gained from side quests as well as crafting pouch items. 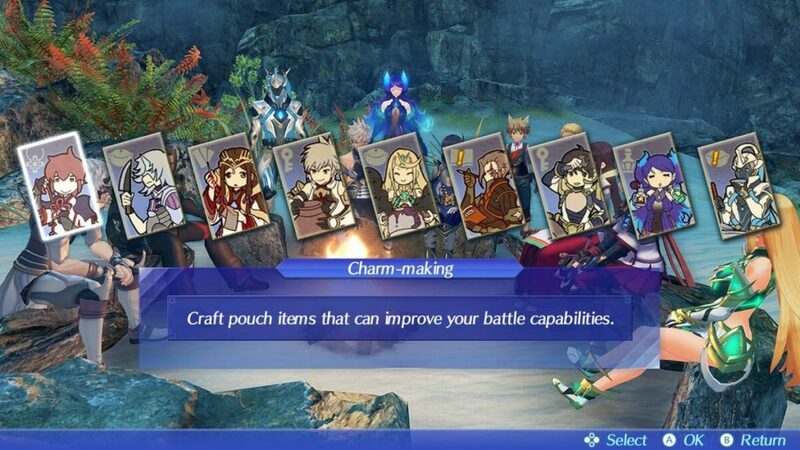 Each character has a crafting specialty, such as Lora’s charms and Mythra’s “creative” cuisine, and use items gathered in the world to create items that boost combat capabilities or provide some permanent benefit such as increased run speed. Party members can also chat with each other at campfires but these are only simple reviews of the current objective and where to go next. Seeing as some of the most heartfelt conversations in video games, and storytelling media in general, come from campfire talks, it’s a bit disappointing they weren’t taken more advantage of here to flesh out the characters outside the main story. 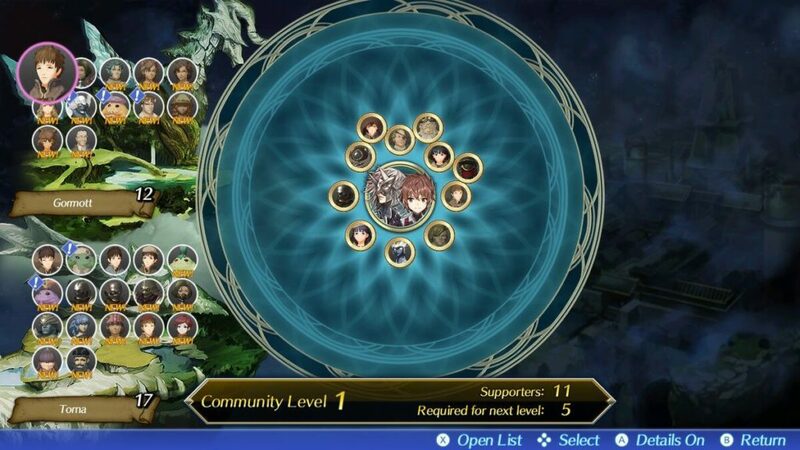 With Torna ~ The Golden Country comes a new side-quest mechanic called Community. It’s rather simple in that as you complete the request of NPC’s they’ll join in your community which represents the support Prince Addam of Torna has with the people. Sometimes people will join your community simply by talking to them, as well. As your community grows it will level up, unlocking new side quests to complete with better rewards in turn. What the game doesn’t tell you up front, however, is that this is not an optional feature that can be ignored. At certain points in the main story, the game will require you to be at a certain community level or higher in order to continue. If you’ve been diligent in completing side-quests as they arose then meeting these requirements may not be too much extra effort. If you had decided to forgo side-quests for a time in favor of progressing the main story or, even worse, ignored them altogether, though, then this grinds any momentum to a screeching halt. This results in having to potentially dedicate hours towards completing numerous requests, a problem that is exacerbated by the sheer tedium of many of them. 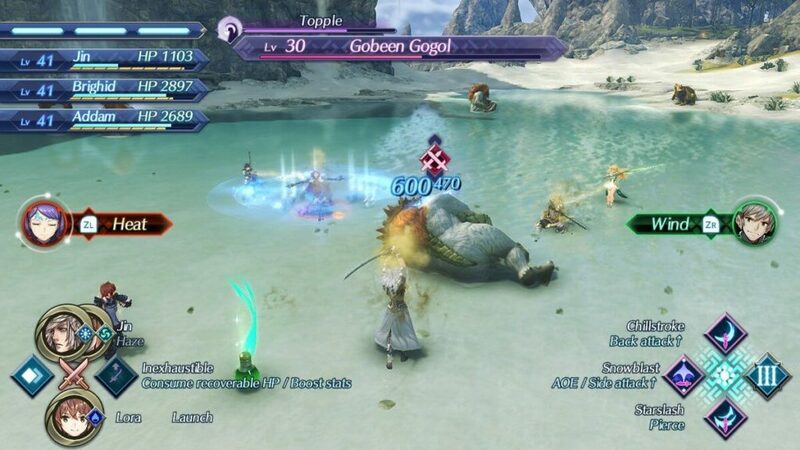 Most requests simply require going to specific locations, slaying X number of Y monster, or gathering X amount of Y items, the last of which being particularly troublesome in that Torna doesn’t fix the original’s problem of being unclear where to exactly find specific collectibles. The Community system as an optional mechanic makes sense to reward players who want to make the most out of their game time. As a mandatory requirement, however, it comes off as more of an excuse to force players to retread tracks through areas they’ve already been to. It’s counter-intuitive to the Xenoblade series’ “play how you want to, do what you want to” attitude games have had up until this point, and is a puzzling decision on Monolith Soft’s part to make. For Xenoblade’s first venture into story DLC, Torna ~ The Golden Country does an admirable job of providing meaningful content that complements the main game. It takes many aspects of the original and puts compelling spins on them that makes the entire 15-30 hour adventure comfortably familiar, yet stimulatingly different. The artificial gating created by the Community system is a rather sizeable blemish on an otherwise rock-solid expansion. The instantly gratifying combat, engrossing story, rewarding exploration of eye-catching locales put in the legwork to make up for this drawback, however, and give players eager to return to Alrest more than enough reason to dive back in. Just to clarify, while the monsters may not be different, their locations and environs are wholly changed overall. Aspers show up in Gormott along with Giant Stag Beetles that you would find in Tantal.